The design of a publication—whether a magazine, book, or website—is a key expression of its identity and editorial strategy. As creative director, art director, and designer, I’ve had the pleasure of working on projects ranging from a book for Kenneth Cole to the launch of new magazines and an upcoming children’s book series for Sterling Publishing. In each case, Li’l Robin takes a nuanced approach to articulating the voice of the publication through design. For our latest project in this arena, we created a new identity for the publication Catalyst Strategic Design Review. The redesigned issue debuted at the end of August. The magazine—written, edited, and designed by students, faculty, and graduates of the Design Management Program—had featured a variety of layouts and design sensibilities throughout its first four issues. To more effectively realize the magazine’s mission, Dr. Mary McBride, a member of Catalyst’s editorial board and Director of the Design Management Program, enlisted Li’l Robin to undertake the redesign. Catalyst aims to reach business leaders, and we felt that to communicate effectively with this audience, the publication needed to have a solidly professional look. Since Catalyst had taken on several design variations, we decided that the first, and most important, phase of the redesign was to create a clear and consistent structure for the magazine. This would establish a branded consistency from issue to issue, so that readers would recognize the Catalyst aesthetic. We achieved this by creating a thorough architecture for all the magazine’s elements—from the feature grid to visual touchpoints such as sidebars, information graphics, and the “Executive Summary” at the beginning of each feature article. The re-envisioned Catalyst is vibrant, with a clean and consistent aesthetic that beautifully frames the editorial content and gives the journal a sophisticated look and feel. To achieve the right tone for the magazine’s audience, we chose classic typefaces that convey the appropriate balance of elegance and seriousness of purpose. For headlines, we selected Miller Display, a striking display font that looks gorgeous when it’s large. That choice also makes the design modern, featuring as it does a large serif font with plenty of white space around it. The italic version of Miller gives the magazine a playfulness, so that its voice isn’t too earnest. For body text, we chose Trade Gothic. Our goal with the typography was to give the magazine an invigorated beauty and grace. Here, the opener conveys visual drama and elegance by juxtaposing large-scale typography with a full-bleed image of a map. 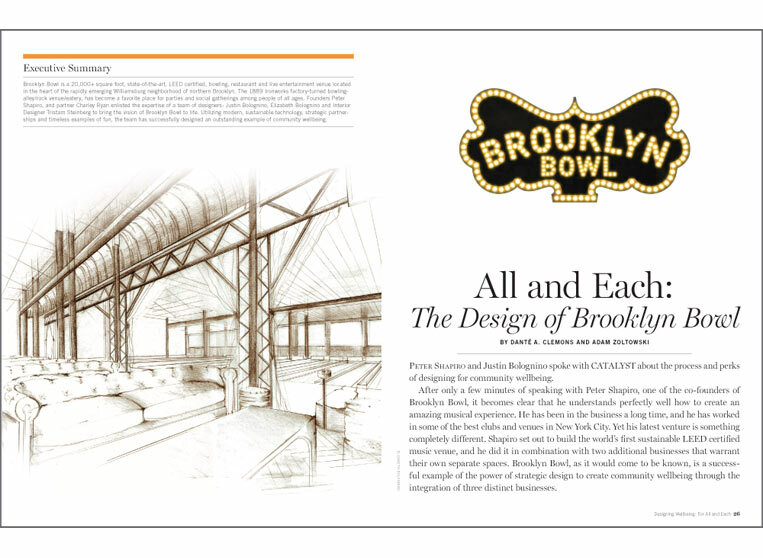 In a story about Brooklyn Bowl, a pioneering LEED-certified music venue, a minimal design featuring an iconic visual conveys both interest and humor. Here and throughout the magazine, the design of features and sections allows photography and pull quotes to be showcased prominently. 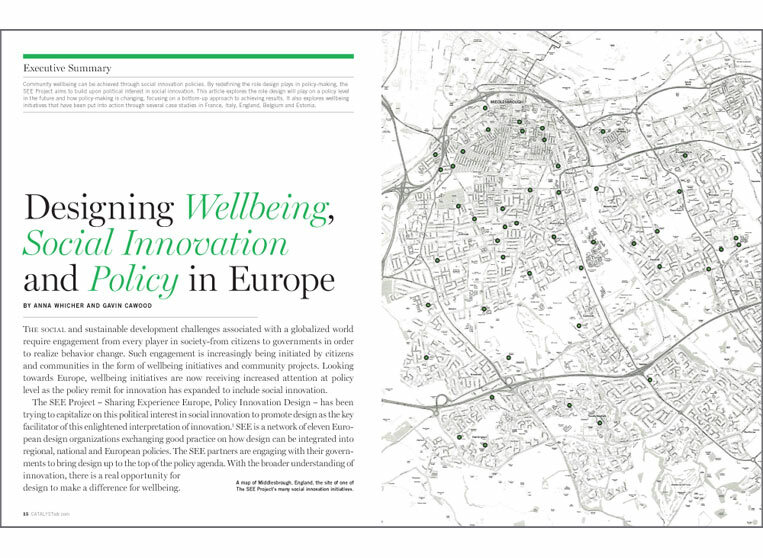 We also designed sidebars, information graphics, and other clearly delineated visual elements to organize the magazine’s content and to provide numerous entry points for the articles. As with all our design projects, we sought to create a thorough system that nevertheless allows for variation and creativity. The redesigned Catalyst has a consistency complemented by a visual intricacy; it’s a balanced palette of structure, complexity, and visual sophistication. • Ensuring consistency in typefaces and the look of the page. • Creating a hierarchy and grid for the page design. • Crafting a design system for the front of the book and back of the book sections, so that the two sections were clearly interrelated and also differentiated from the feature well. 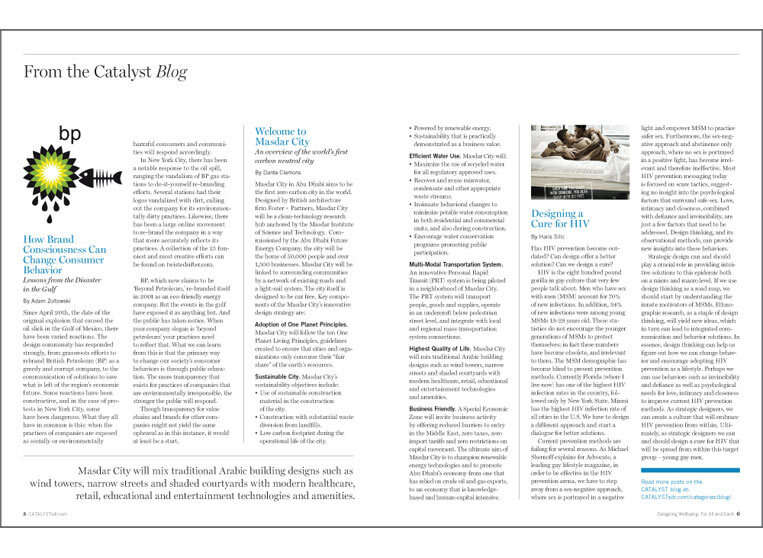 You can check out articles from the issue at the Catalyst website or purchase a printed copy here.